Farewell to Europe, by Aleksander A Sochaczewski. 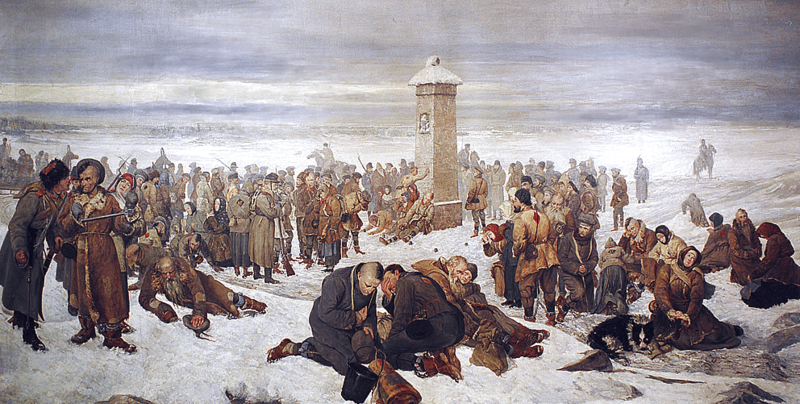 The painting depicts participants of the January 1863 Uprising on their forced march to serve their sentences in Siberia. The obelisk marks the geographic border line between Europe and Asia. The artist himself is among the exiled here, near the obelisk, on the right. The uprising began as a spontaneous protest by young Poles against conscription into the Imperial Russian Army. It was soon joined by high-ranking Polish-Lithuanian officers and various politicians. The insurrectionists, severely outnumbered and lacking serious outside support, were forced to resort to guerrilla warfare tactics. Reprisals against insurgents included the Tsar’s abolition of serfdom that granted land at low value (namely, the market price) and was designed to draw support of peasants away from the Polish nation and disrupt the national economy. Public executions and deportations to Siberia led many Poles to abandon armed struggle and turn instead to the idea of “organic work”: economic and cultural self-improvement. This entry was posted in History on July 16, 2015 by RomanInUkraine.